For the opera, see Satyagraha (opera). For the 2013 Hindi film, see Satyagraha (film). Satyagraha (Sanskrit: सत्याग्रह; satya: "truth", āgraha: "insistence" or "holding firmly to") or holding onto truth or truth force – is a particular form of nonviolent resistance or civil resistance. Someone who practices satyagraha is a satyagrahi. The term satyagraha was coined and developed by Mahatma Gandhi (1869–1948). He deployed satyagraha in the Indian independence movement and also during his earlier struggles in South Africa for Indian rights. Satyagraha theory influenced Martin Luther King Jr.'s and James Bevel's campaigns during the Civil Rights Movement in the United States, and many other social justice and similar movements. 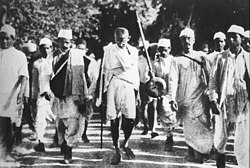 Gandhi leading the 1930 famous Salt March, a notable example of satyagraha. Truth (satya) implies love, and firmness (agraha) engenders and therefore serves as a synonym for force. I thus began to call the Indian movement Satyagraha, that is to say, the Force which is born of Truth and Love or non-violence, and gave up the use of the phrase “passive resistance”, in connection with it, so much so that even in English writing we often avoided it and used instead the word “satyagraha” itself or some other equivalent English phrase. In September 1935, a letter to P. K. Rao, Servants of India Society, Gandhi disputed the proposition that his idea of Civil Disobedience was adapted from the writings of Henry David Thoreau especially Civil Disobedience of 1849. The statement that I had derived my idea of civil disobedience from the writings of Thoreau is wrong. The resistance to authority in South Africa was well advanced before I got the essay of Thoreau on civil disobedience. But the movement was then known as passive resistance. As it was incomplete, I had coined the word satyagraha for the Gujarati readers. When I saw the title of Thoreau’s great essay, I began the use of his phrase to explain our struggle to the English readers. But I found that even civil disobedience failed to convey the full meaning of the struggle. I therefore adopted the phrase civil resistance. Non-violence was always an integral part of our struggle." I have also called it love-force or soul-force. In the application of satyagraha, I discovered in the earliest stages that pursuit of truth did not admit of violence being inflicted on one’s opponent but that he must be weaned from error by patience and compassion. For what appears to be truth to the one may appear to be error to the other. And patience means self-suffering. So the doctrine came to mean vindication of truth, not by infliction of suffering on the opponent, but on oneself. "I have drawn the distinction between passive resistance as understood and practised in the West and satyagraha before I had evolved the doctrine of the latter to its full logical and spiritual extent. I often used “passive resistance” and “satyagraha” as synonymous terms: but as the doctrine of satyagraha developed, the expression “passive resistance” ceases even to be synonymous, as passive resistance has admitted of violence as in the case of the suffragettes and has been universally acknowledged to be a weapon of the weak. Moreover, passive resistance does not necessarily involve complete adherence to truth under every circumstance. Therefore it is different from satyagraha in three essentials: Satyagraha is a weapon of the strong; it admits of no violence under any circumstance whatsoever; and it ever insists upon truth." It is important to note the intrinsic connection between ahimsa and satyagraha. Satyagraha is sometimes used to refer to the whole principle of nonviolence, where it is essentially the same as ahimsa, and sometimes used in a “marked” meaning to refer specifically to direct action that is largely obstructive, for example in the form of civil disobedience. It is perhaps clear from the foregoing, that without ahinsa it is not possible to seek and find Truth. Ahimsa and Truth are so intertwined that it is practically impossible to disentangle and separate them. They are like the two sides of a coin, or rather of a smooth unstamped metallic disk. Nevertheless, ahimsa is the means; Truth is the end. Means to be means must always be within our reach, and so ahimsa is our supreme duty. Assessing the extent to which Gandhi's ideas of satyagraha were or were not successful in the Indian independence struggle is a complex task. Judith Brown has suggested that "this is a political strategy and technique which, for its outcomes, depends of historical specificities." The view taken by Gandhi differs from the idea that the goal in any conflict is necessarily to defeat the opponent or frustrate the opponent’s objectives, or to meet one’s own objectives despite the efforts of the opponent to obstruct these. In satyagraha, by contrast, “The Satyagrahi’s object is to convert, not to coerce, the wrong-doer.” The opponent must be converted, at least as far as to stop obstructing the just end, for this cooperation to take place. There are cases, to be sure, when an opponent, for e.g. a dictator, has to be unseated and one cannot wait to convert him. The satyagrahi would count this a partial success. If I want to deprive you of your watch, I shall certainly have to fight for it; if I want to buy your watch, I shall have to pay for it; and if I want a gift, I shall have to plead for it; and, according to the means I employ, the watch is stolen property, my own property, or a donation. Civil disobedience and non-cooperation as practised under satyagraha are based on the “law of suffering”, a doctrine that the endurance of suffering is a means to an end. This end usually implies a moral upliftment or progress of an individual or society. Therefore, the non-cooperation of satyagraha is in fact a means to secure the cooperation of the opponent that is consistent with truth and justice. ...an honest, respectable man will not suddenly take to stealing whether there is a law against stealing or not, but this very man will not feel any remorse for failure to observe the rule about carrying headlights on bicycles after dark.... But he would observe any obligatory rule of this kind, if only to escape the inconvenience of facing a prosecution for a breach of the rule. Such compliance is not, however, the willing and spontaneous obedience that is required of a Satyagrahi. Gandhi envisioned satyagraha as not only a tactic to be used in acute political struggle, but as a universal solvent for injustice and harm. Suffer the anger of the opponent. Never retaliate to assaults or punishment; but do not submit, out of fear of punishment or assault, to an order given in anger. Voluntarily submit to arrest or confiscation of your own property. If you are a trustee of property, defend that property (non-violently) from confiscation with your life. Do not curse or swear. Do not insult the opponent. Neither salute nor insult the flag of your opponent or your opponent’s leaders. If anyone attempts to insult or assault your opponent, defend your opponent (non-violently) with your life. As a prisoner, behave courteously and obey prison regulations (except any that are contrary to self-respect). As a prisoner, do not ask for special favourable treatment. As a prisoner, do not fast in an attempt to gain conveniences whose deprivation does not involve any injury to your self-respect. Joyfully obey the orders of the leaders of the civil disobedience action. Like most people, I had heard of Gandhi, but I had never studied him seriously. As I read I became deeply fascinated by his campaigns of nonviolent resistance. I was particularly moved by his Salt March to the Sea and his numerous fasts. The whole concept of Satyagraha (Satya is truth which equals love, and agraha is force; Satyagraha, therefore, means truth force or love force) was profoundly significant to me. As I delved deeper into the philosophy of Gandhi, my skepticism concerning the power of love gradually diminished, and I came to see for the first time its potency in the area of social reform. ... It was in this Gandhian emphasis on love and nonviolence that I discovered the method for social reform that I had been seeking. If I were a Jew and were born in Germany and earned my livelihood there, I would claim Germany as my home even as the tallest Gentile German might, and challenge him to shoot me or cast me in the dungeon; I would refuse to be expelled or to submit to discriminating treatment. And for doing this I should not wait for the fellow Jews to join me in civil resistance, but would have confidence that in the end the rest were bound to follow my example. If one Jew or all the Jews were to accept the prescription here offered, he or they cannot be worse off than now. And suffering voluntarily undergone will bring them an inner strength and joy [...] the calculated violence of Hitler may even result in a general massacre of the Jews by way of his first answer to the declaration of such hostilities. But if the Jewish mind could be prepared for voluntary suffering, even the massacre I have imagined could be turned into a day of thanksgiving and joy that Jehovah had wrought deliverance of the race even at the hands of the tyrant. For to the God-fearing, death has no terror. ...there should be unadulterated non-violent non-cooperation, and if the whole of India responded and unanimously offered it, I should show that, without shedding a single drop of blood, Japanese arms – or any combination of arms – can be sterilized. That involves the determination of India not to give quarter on any point whatsoever and to be ready to risk loss of several million lives. But I would consider that cost very cheap and victory won at that cost glorious. That India may not be ready to pay that price may be true. I hope it is not true, but some such price must be paid by any country that wants to retain its independence. After all, the sacrifice made by the Russians and the Chinese is enormous, and they are ready to risk all. The same could be said of the other countries also, whether aggressors or defenders. The cost is enormous. Therefore, in the non-violent technique I am asking India to risk no more than other countries are risking and which India would have to risk even if she offered armed resistance. ^ a b Uma Majmudar (2005). Gandhi's pilgrimage of faith: from darkness to light. SUNY Press. p. 138. ISBN 9780791464052. ^ http://www.britannica.com/EBchecked/topic/525247/satyagraha "Gandhi’s satyagraha became a major tool in the Indian struggle against British imperialism and has since been adopted by protest groups in other countries." Date accessed: 14 September 2010. ^ https://www.questia.com/PM.qst?a=o&d=9165422 "In this respect Satyagraha or non-violent resistance, as conceived by Gandhiji, has an important lesson for pacifists and war-resisters of the West. Western pacifists have so far proved ineffective because they have thought that war can be resisted by mere propaganda, conscientious objection, and organization for settling disputes." Date accessed: 14 September 2010. ^ Nagler, Michael N. The Nonviolence Handbook: A Guide for Practical Action. Print. ^ Gross, David M. (2014). 99 Tactics of Successful Tax Resistance Campaigns. Picket Line Press. pp. 15–17. ISBN 978-1490572741. ^ M.K. Gandhi, Satyagraha in South Africa, Navajivan, Ahmedabad, 1111, pp. 109–10. ^ Mohandas K. Gandhi, letter to P. Kodanda Rao, 10 September 1935; in Collected Works of Mahatma Gandhi, electronic edition, vol. 67, p. 400. ^ Gandhi, Mahatma. Non-violent Resistance (Satyagraha). Mineola, N.Y.: Dover, 2001. Print. ^ R. K. Prabhu & U. R. Rao, editors; from section “The Gospel Of Sarvodaya, of the book The Mind of Mahatma Gandhi Archived 20 December 2010 at the Wayback Machine, Ahemadabad, India, Revised Edition, 1967. ^ R. K. Prabhu & U. R. Rao, editors; from section “Between Cowardice and Violence,” of the book The Mind of Mahatma Gandhi Archived 20 December 2010 at the Wayback Machine, Ahemadabad, India, Revised Edition, 1967. ^ R. K. Prabhu & U. R. Rao, editors; from section “Power of Satyagraha,” of the book The Mind of Mahatma Gandhi Archived 20 December 2010 at the Wayback Machine, Ahemadabad, India, Revised Edition, 1967. ^ King, Jr., Martin Luther (1998). Carson, Clayborne (ed.). The Autobiography of Martin Luther King, Jr. pp. 23–24. ISBN 0-446-52412-3. 'Satyagraha 100 Years Later', a retrospective with Arun Gandhi from Democracy Now! GandhiPoetics.com A site that analyzes and previews the poetry associated with Gandhi's Satyagraha movement.